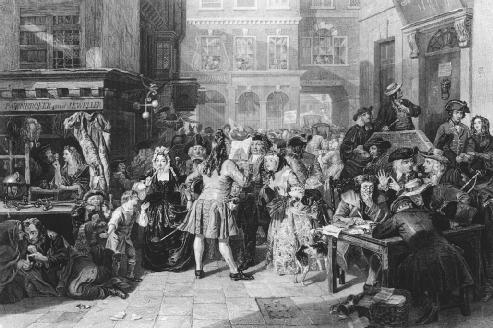 Anxious investors wait for news about the South Sea Company, a joint stock company formed in London in 1711. Joint stock companies are a form of partnership in which each member, or stockholder, is financially responsible for the acts of the company. An association engaged in a business for profit with ownership interests represented by shares of stock. A joint stock company is financed with capital invested by the members or stockholders who receive transferable shares, or stock. It is under the control of certain selected managers called directors. A joint stock company is a form of partnership, possessing the element of personal liability where each member remains financially responsible for the acts of the company. It is not a legal entity separate from its stockholders. A joint stock company differs from a partnership in that the latter is composed of a few persons brought together by shared confidence. Partners are not free to retire from the firm or to substitute other persons in their place without prior assent of all the partners. A partner's death causes the dissolution of the firm. In contrast, a joint stock company consists of a large number of stockholders who are unacquainted with each other. A change in membership or a transfer of stock has no effect on the continued existence of the company and the death of a stockholder does not result in its dissolution. Unlike partners in a partnership, a stockholder in a joint stock company has no agency relationship to the company or any of its members. A joint stock company is similar to a corporation in that both are characterized by perpetual succession where a member is allowed to freely transfer stock and introduce a stranger in the membership. The transfer has no effect on the continuation of the organization since both a joint stock company and a corporation act through a central management, board of directors, trustees, or governors. Individual stockholders have no authority to act on behalf of the company or its members. A joint stock company differs from a corporation in certain respects. A corporation exists under a state charter, while a joint stock company is formed by an agreement among the members. The existence of a joint stock company is based upon the right of individuals to contract with each other and, unlike a corporation, does not require a grant of authority from the state before it can organize. While members of a corporation are generally not held liable for debts of a corporation, the members of a joint stock company are held liable as partners. In a legal action, a corporation sues and is sued in its corporate name, but a joint stock company sues and defends in the name of a designated officer. To establish a joint stock company, the owners had to obtain a prior approval (concession system). Address : Open Joint Stock Company "AFPK" Zhlobin Meat Processing Plant "
Hassan bin Fadhel Aqeel, the Deputy of Ministry of Commerce and Industry for Internal Trade said that the Minister has approved the transformation of Yamama Company for Red Bricks and Clay Products with a capital of SR 220 million from a limited liability company into a closed joint stock company. The Government of Kyrgyzstan plans to set up an open joint stock company Kambar-Ata-2 hydroelectric station to complete construction of the water power station, announced Deputy Minister of Industry, Energy and Fuel Resources Akylbek Tumenbaev during session of the Parliamentary Committee for Fuel and Energy Complex today. MOSCOW, Russia -- Sistema (LSE:SSA) the largest private sector consumer services company in Russia and the CIS, announced today that the Moscow Arbitration Court dismissed the lawsuit filed by Open Joint Stock Company ASVT ("AVST") against Sistema on October 12, 2005 for approximately 50 billion rubles (US$1. The record of state registration of the Company's Charter in a new version with the change of name of the Company on the Public Joint Stock Company "Acron" entered in the Unified State Register of Legal Entities 28 June 2016 (the date of the name change). Summary: Riyadh, Safar 26, 1432, Jan 30, 2011, SPA -- The Minister of Commerce and Industry Abdullah bin Ahmed Zaynal Ali Reza, approved here today the transformation of Saudi Airlines Company for Catering from a limited liability to a closed joint stock company. The Parties will facilitate establishment of the Joint Stock Company in line with the effective legislation of the Kyrgyz Republic, in which Russia\'s Unified Energy System (INTER RAO EES) and Kyrgyzstan\'s Electric Stations OJSC will have 50% each in the equity capital. MOSCOW, Russia -- Sistema (LSE:SSA), the largest private sector consumer services company in Russia and the CIS, today announced that, according to press reports, Open Joint Stock Company ASVT ("ASVT") has filed a lawsuit against Sistema in a Russian court for approximately 50 billion rubles (US$1. Major organization : OPEN JOINT STOCK COMPANY "SYSTEM OPERATOR OF UNIFIED ENERGY SYSTEM"OPEN JOINT STOCK COMPANY "SYSTEM OPERATOR OF UNIFIED ENERGY SYSTEM"
Al-Medaifer told the Prince that Maaden is a joint stock Company.